Salzburg Research and partners are currently supporting 20 collaborative projects between labs and companies to accelerate digital innovation as part of the Labs4SMEs project. In January 2019, we organized an input workshop on “Business Models for Innovation Projects” for representatives of cooperation projects. Salzburg Research provided insight into different methods and tools for developing business models and supporting business model innovation. This input led to exciting findings in the individual innovation projects. An active participation and a lively exchange was guaranteed. 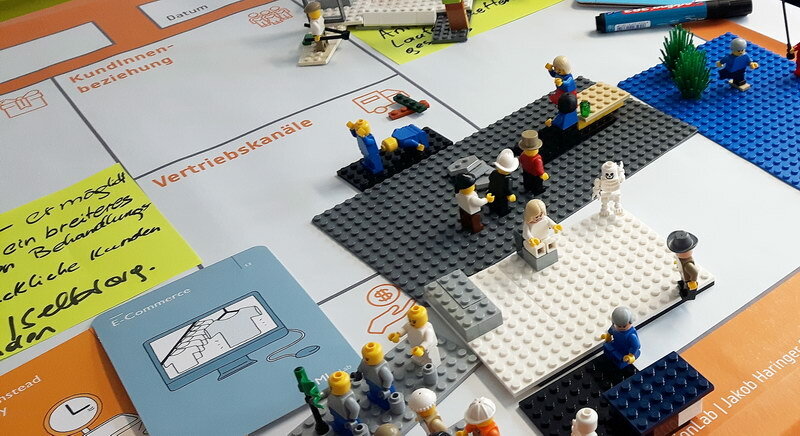 Especially with the method “Lego Serious Play”, a common view on the respective problems and the defined target situation of the projects arose in a very short time for all participants. By building, tuning and optimizing the models, a common understanding of the projects was developed and worked on interesting solution processes. The Labs.4.SMEs Innovation Challenge seeks to strengthen cooperation between SMEs and InnoLabs to make the innovation process in companies more efficient, cost-effective and faster, and to increase the share of innovative companies. Participation was open to SMEs from the participating project regions (Interreg V-A Italy-Austria – AT: Salzburg, Tyrol and IT: Friuli Venezia Giulia, South Tyrol, Veneto). Twenty-five innovation projects were selected by a jury, which have been implemented in the form of a joint “SME-LAB cooperation” since October 2018. Use of the lab infrastructure of a technological workshop to the extent of at least 3 months. The project Labs-4-SMEs is funded by the European Regional Development Fund and Interreg V-A Italy-Austria 2014-2020.